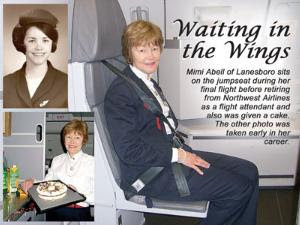 Mimi Abell retired from Northwest Airlines last month after 41 years of service as a flight attendant with the airline. To mark her retirement, The Republican-Leader, her hometown newspaper in Minnesota, ran a feature story about Mimi Abell, accompanied by the photos at right. The photos show Mimi during her final flight, and as she looked early in her career. Mimi Abell joined Northwest Orient Airlines (as it was then called) in 1967. 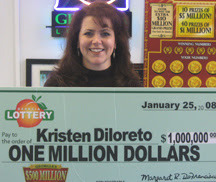 She was based at Minneapolis-St.Paul for her entire career. Mimi Abell always has been a very busy person. In addition to her flying career, and being a mother, she and her late husband, whom she married in 1989, owned and operated Mrs. B's Inn and Restaurant in Lanesboro, MN. Mimi also did a lot of volunteer work in her community -- as a Girl Scout leader, an adult literacy teacher, and a volunteer probation officer. In addition, she found the time to earn a Private Pilot's License, and to finish her college education at the University of Minnesota. Go and read Waiting in the Wings... the Republican-Leader's article about Mimi Abell. It is a story that will ring true to cabin crew everywhere.